This brown sugar baked ham is easy to make and everyone that tries it loves it! Sweet, tender ham that is easy to make and tastes fantastic! I’ve been making this brown sugar baked ham for years now, and I still love it just as much as I did the first time I made it. But….the cooking method is a little weird. I’ll admit it. I was skeptical the first time I tried it, but no longer. It really makes the best baked ham. You need to pre-cook this ham before baking it. The first step is to boil the ham in a vinegar and water solution, or to pressure cook it in the vinegar/water solution if you have an Instant Pot. Then you shred the ham (it absolutely falls apart), layer it with brown sugar and dry mustard, and bake it. And it doesn’t taste like vinegar, I promise. It tastes like the best brown sugar baked ham you’ve ever had. Boneless hams are easier to slice, but I have found that they don’t have as much flavour as bone in hams, and the texture is sometimes a bit mushy. So I nearly always buy a bone in ham. And the slicing aspect doesn’t even matter for this recipe, because the ham gets so tender that slicing is almost impossible, and you need to shred it instead. What’s the best cut of ham? I like to get a half ham, or shank ham, with the bone in. They are usually quite large but do freeze very well. So if you only want to cook half of it and freeze the other half that’s an option. Or cook it and then freeze it for later. The only kind of ham you will definitely want to avoid for this recipe is a spiral cut ham. A spiral cut ham will turn out quite dry with this recipe. How many people will my ham feed? A good estimate for how many people your ham will feed is 3/4 pound per person for a bone in ham and 1/2 pound per person for a boneless ham. The ham I cooked this time was 8 pounds with the bone in, and 6 pounds once I removed it. So theoretically that should serve about 12 adults. I think it actually would have served 16-20, but it obviously depends on how much everyone present eats! For my family of five this ham was enough for two dinners. We also fried some up with eggs for breakfast a couple times. Plus sandwiches at lunch for a few days. So it lasted just over a week in my house. Ham lasts for quite a while, so it’s not a bad thing to have leftovers of! 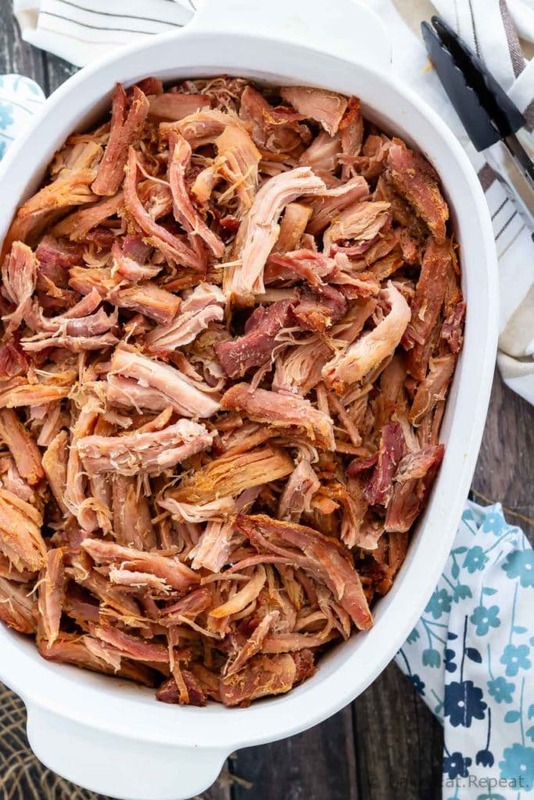 To make this brown sugar baked ham, you will need either a large pot that will fit the ham, covered with a water/vinegar solution, and with enough space left in the pot that you can keep it at a boil for 2 to 2 1/2 hours without it boiling over constantly and driving you crazy. Since trying this recipe in the Instant Pot I will likely never boil it again because it’s so much easier and faster to pressure cook it! There are details on cooking it in the Instant Pot in the recipe notes. Make sure to cook the ham long enough that it is falling apart easily. If it’s not tender enough to shred easily then you should cook it a little longer. It should shred very easily. You can prepare the ham for baking up to two days ahead of time. Do the vinegar/water step and layer it in the baking dish with the brown sugar and dry mustard, then cover it tightly and refrigerate until you’re ready to bake. 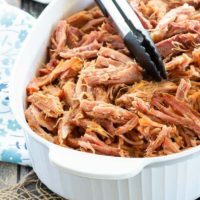 Here are some great recipes for you that you can use the leftovers in: Creamy Ham and Corn Chowder, Ham Egg and Cheese Pretzel Rolls, and Creamy One Pot Turkey and Rice (use chopped ham instead of turkey). Place the ham in a large pot and add a vinegar and water solution (one part vinegar to two parts water) until the ham is covered. Cover the pot and bring the liquid to a boil over high heat. Turn the heat down to medium so that it isn’t splashing everywhere and allow it to boil for 2 to 2 1/2 hours, or until the meat is tender and falling off the bone. Cut the ham into 3-4 inch chunks, removing the fat and bone. Place all the pieces into the insert of your Instant Pot, making sure not to fill it about the 2/3 fill line. Add a vinegar and water solution (one part vinegar to two parts water) until the ham is covered (no higher then the 2/3 fill line on the pot). Place the lid on the Instant Pot and turn it to the locked position. Make sure the valve is in the sealing position. Cook on high pressure for 8 minutes per pound (weigh your ham after removing the bone and fat as it will be less then the package indicates - I had an 8 pound ham and it was 6 pounds of ham after removing the bone and fat). When the cook time is finished, let the pressure naturally release for 10 minutes and then quick release the remaining pressure. The ham should be very tender. 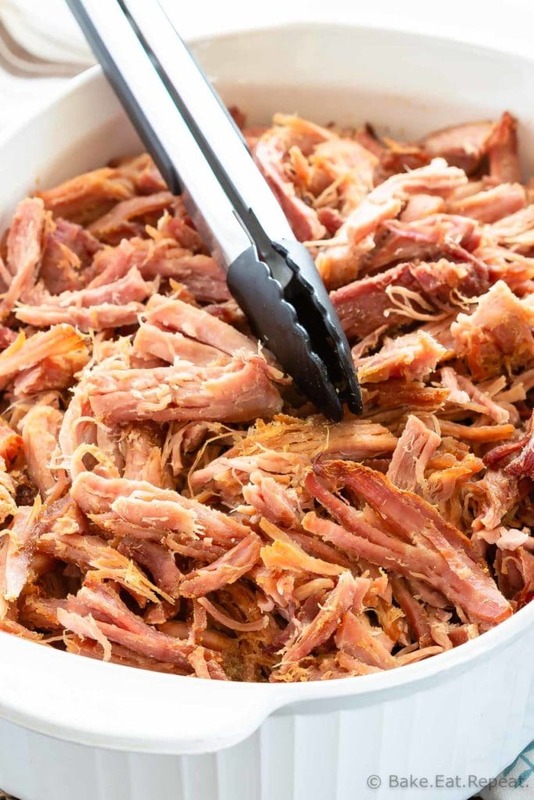 Take the ham from the pot (or Instant Pot) and shred it with two forks, discarding the fat and bones if you cooked it on the stovetop. It should shred very easily. 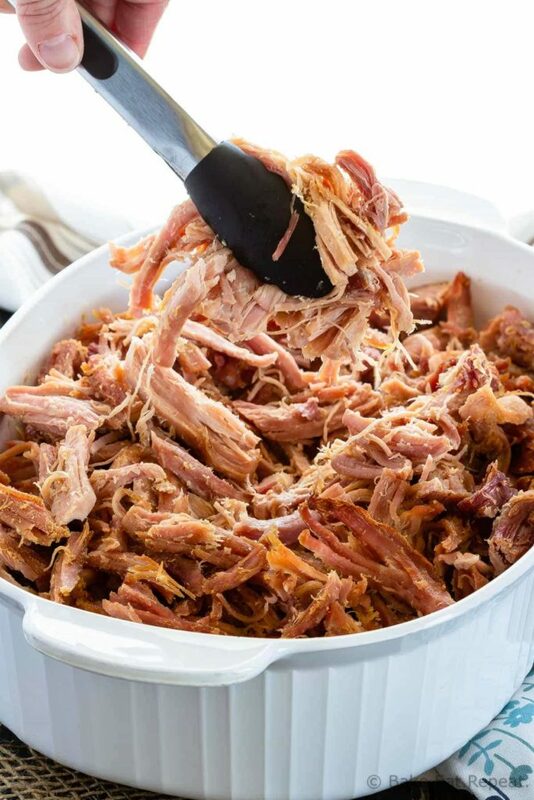 Layer half the shredded meat in a large baking dish. 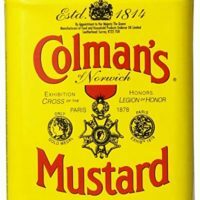 In a small bowl, stir together the brown sugar and dry mustard. Sprinkle half of this mixture over the shredded ham. Layer the other half of the meat on top of this and sprinkle with the rest of the brown sugar mixture. 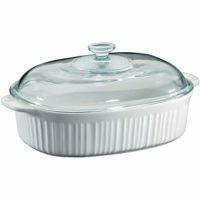 Cover the pan tightly with aluminum foil or a lid and refrigerate until you’re ready to bake it, up to two days ahead of time. Bake the ham for one hour and serve warm. Note: The recipe calls for a 1:2 ratio of vinegar to water. This is generally how I make this ham, but have made it with as little as a 1:4 vinegar to water ratio when I didn’t have enough vinegar for my huge pot and it was still amazing. So you can still make it if you don’t have quite enough vinegar. Make sure to use a bone in cut of ham, and not a spiral cut ham. 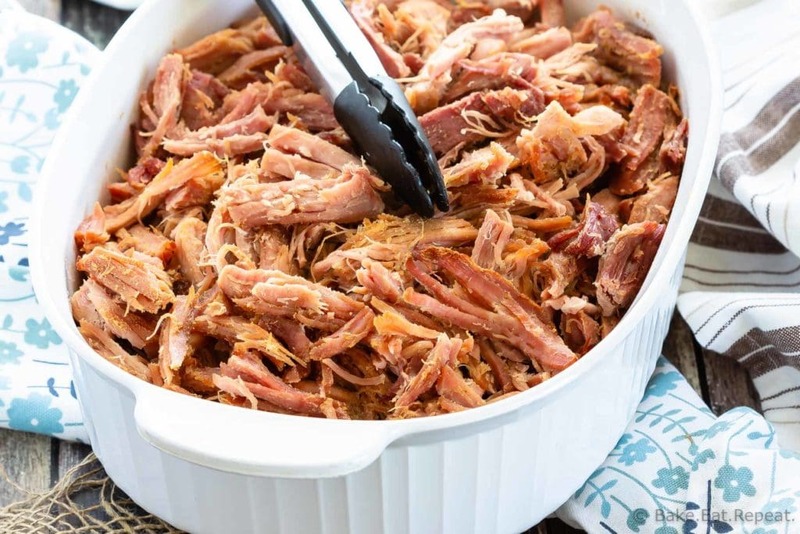 If you’re making this ham in the Instant Pot instead of on the stove, you don’t need nearly as much water/vinegar to cover it as the ham is cut into chunks and the bone removed before cooking. 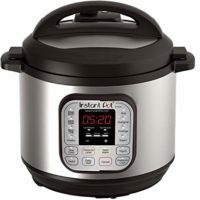 I have an 8 quart Instant Pot so I could still make a large half ham (8 pounds before removing the bone) in it, but you will need to get a smaller ham if you only have a 6 quart Instant Pot. 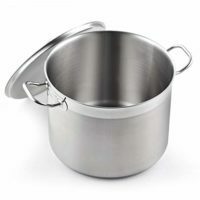 The 8 quart pot was almost at the 2/3 fill line with an 8 pound ham - so with a 6 quart pot you will likely need to get a ham that is about 6 pounds (before removing the bone/fat) to be able to cook it all at one time. Source: Recipe from Mel’s Kitchen Cafe. If your pot isn't large enough, could you cut the ham in chunks to boil it (like you cut the ham in chunks in the Instapot)? Have you tried that? THANKS! I haven't tried that because I have an enormous stockpot so I don't need to, but I would imagine that would work. I think you probably wouldn't need to boil it for quite as long then....you might want to check if it's tender after an hour or so instead of waiting the full 2 1/2 hours. If it shreds easily then it's done. Not having done it that way I can't say for sure how long you would need to boil it if it's in chunks though - but I'm guessing it would be less! What kind of vinegar do you use. I see the comment on apple cider vinegar but don't see what kind see the recipe call for. I use white vinegar for this recipe. Hi, can I use apple cider vinegar? Hi Lora, I haven't tried it but I think it would work just fine, although it would change the flavour a bit. Let me know how it turns out if you try it!